Today Alfie and I have been married for 17 years. We met twenty years ago in what seems another age but clicked straight away and have been best friends ever since. I think that’s our strength, that we actually like each other. We talk about everything and still make each other laugh. Through the ups and downs of life that we all experience, the greatest gift Alfie has given me is allowing me to be myself. Thanks for that, hon, I love it more than a diamond ring, but if you ever feel so inclined…. There was an apricot tree in our garden when I was a kid. I never saw an apricot until I came to Australia and I thought it was a wondrous thing. The tree was resplendent with velvet-covered egg yolks. In high summer the scent filled the garden so all you had to do was stick out your tongue to taste the sweetness. Parrots came. Finches, honeyeaters, chuckled, searching for fallen fruit. Magpies swooped, scaring the little ones. I watched from the verandah, hoping the birds would never leave, wishing the tree would bear fruit all year long. The birds ate until the grass turned golden like King Midas had walked the length of it. Then they flew away. Two remained, walking and eating together, so close I could have sworn their wings were linked. Little galahs, pink and grey feathers, soft as suede, chubby feet walking in time, looking like they each meant something to the other. I was only 12 but I realised they were in love. The thought made me warm inside. Love is described in so many ways. It makes the world go around. It’s a many-splendoured thing. It means never having to say you’re sorry. (Actually, I think that’s divorce.) It’s all around us, it’s a drug, a battlefield, and when it goes wrong, it tears us apart. There is much about love that not even the glory of a peach-coloured sunset can compare to. The secret smiles, finishing each other’s sentences, harmony, trust, the comfort of being in synch, being at peace in your own life. In its many guises, love continues to enchant us. Today I say : “Hooray For Love,” for when it’s good, it is a whispered voice standing at your shoulder, saying no matter what, everything will be alright. It fills your hands with hope, like summer shells gathered at the beach whose colours never fade. Congratulations and happy anniversary. Himself and I will mark our 19th year this coming July. Love is odd, but that’s what is so great about it, right? You never know what to expect, yet we can still find comfort in the familiar. Happy anniversary. Seventeen years is well on your way to 50. And when you get to fifty years, people say all sorts of things. In these trying times, just getting to 50 married years is a real challenge. I came to thank you for stopping at my blog. I appreciate it very much. My wife, Patty, and I, were married in 1955, on July 12th of that year. So we have been married over 52 years. Hooray for you and Alfie. Congratulations. You write such wonderful posts! this is such a lovely post.. i am envious of your love affair,, and i am sure i am not alone… how unusual that you chose a photo of bonnie and clyde to represent love… i would find that so much more my ideal romance than yours……. Daoine – thank you so much. You guys are doing so well too. Six years is nothing to be sniffed at these days. Good going. I had a friend who was married three times in under ten years. Every time she said ‘bridesmaid’ we all came out in a cold sweat. Still, she’s been married so many times that it’s allowed all of her friends to have a go at being bridesmaid. She’s very fair in that way. LOL! KAREN – you have totally hit the nail on the head. Love is odd and comfortable all at the same time. Congrats on nearly 19 years. That’s awesome! ABRAHAM – thanks so much for visiting. 52 years! That is marvellous. My parents are at nearly 48 years and still going strong. Congratulations! DAVID M – thank you. So glad to see you back. Hope you had a good Chrissie and New Year! 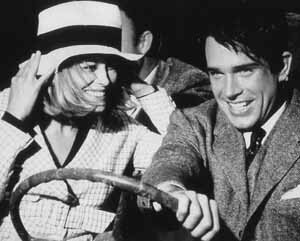 PAISLEY – you won’t believe this but when I posted that photo from ‘Bonnie & Clyde’ I thought: “I bet Paisley gets this.” And you did. There are certainly elements to my marriage that are like Bonnie & Clyde, sometimes we feel like outsiders battling the uber-powers that be. Both of us also have a bit of a maverick attitude to life, so I thought the photo was apt. I also love the classic movies as you know and really love this shot. It says so much about love, don’t you think? The true story of Penelope Pitstop and Peter Perfect (Car #9). I love it! Congratulations. I like how you’ve captured the essence of love – it’s a rare thing these days to see couples who just like hanging out together. Happy Anniversary! Your description of the apricot tree and the arrival of the birds was beautiful. CHRIS – I had forgotten about Peter Perfect. Now that’s what you call a perfect match. Classic! KATE – Awww, you are a sweetie. Thank you!